To recap: About 55 Se7ens from USA7s descended on the idyllic hamlet of Deal's Gap to beat the bejesus out of the Dragon. Naturally, Jalopnik was there. You can read all about the exploits in yesterday's Se7en, Se7en, Oh My Se7en! . Today we're going to focus on some of the individual cars that piqued our fancy and hand out some "awards." The word "awards" in quotes because this article is 5 egos past subjective. The deal is that the entire 7-7-7 event was a function of a car club (USA7s). As such, each car is somebody's pride and joy. Moreover, the owners' wanted their spouse or an actual friend to ride shotgun. Not some dirty old blogger. The result was that I didn't get to spend as much time with as many of the cars as I would have liked. Plus, I only had two days. And had to enjoy some beers with Norm and Mike. So, that killed an hour or so right there. But enough with the excuses, let's go! From the moment it pulled into the Tapoco Lodge's parking lot Ed Hudson's 1998 Caterham Superlight R caught my eye and refused to give it back. Painted in classic Jaguar racing green with black carbon fiber bits (nosecone and fenders) this Superlight has a positively menacing stance. Also nice were the gullwing-ish half doors and carbon weave seats. Sadly, my clumsy camera work does it no justice. This Se7en would be perfect for that rare occasion that Mad Max had to attend a black tie function. A truly sinister beaut. Due to a camera malfunction (I'm an idiot) we don't have any photos of Paul & Terry Brocious's Locost. [Update: Al Navarro to the rescue!] Which is a shame. A Locost is a homebuilt Se7en (as opposed to from a manufacturer). The phenomenon started with the publication of Ron Champion's book, Build Your Own Sports Car for as Little as £250 and Race It!. Paul (son) and Terry (father) had never even heard of a Se7en before Terry, "found plans floating around the internet." The duo built their Locost in 7 months time for around $6,000. The heart of their car is a Yamaha R1 engine. OK, it's not a Hyabusa, but still, the sucker revs to 14,000 rpm in a heart beat and blats out 170 hp. Absolutely perfect for a Se7en. What truly makes the Brocious's car stand out is its homemade sequential paddle shifter. Just imagine banging through the gears with such a fast motor. It's like a homegrown F1 car, only several million cheaper. Almost as cool, is how they got the Locost to move backwards. To reverse, you pull a lever under the dash which engines a winch motor from an ATV. If it dies, big deal, go buy another winch motor. Another great touch was the front traverse leaf spring. Not only does it help to Americanize the car (and spin Chapman round and round in his grave), but is has to be a Se7en first. Oh, and the seats? From a Pontiac Montana. Locost indeed. Do you see that turbo? It's the size of a watermelon! And happens to be attached to a JDM SR20 motor. How much power are we talking? "Could be 600 hp," answered Bob Drye, the head of Champion Motor Cars. That's Viper power in car that weighs half as much. There aren't any doors, either. Bob says "could be" because his suicide-solution Se7en just didn't get finished in time. Still, he was kind enough to trailer it down from Virginia for all of us to stare nervously at. And I'm still breathing. When Paul Roupas first dropped the hammer in his Deman USA SR27 I thought I was dead. Not because he's a poor driver (quite the opposite, actually), but because physical matter doesn't move that quickly. It was as if I was no longer bound by Newton's laws. It also didn't help that my head got smashed against the rock hard racing seat. I asked Paul and his business partner Dino Trakas about the engine. The turbocharged SR20 DET savagely dyno'd 320 hp at the wheel. Which means the motor is good for around 375 hp. And the SR27 weighs 1,400 lbs. Which is insane! If I had to guess, 60 mph shows up in about 3 seconds. Halfway up the Dragon we stopped for photos and Paul asked if I wanted to drive it down. I should have said, "duh" but instead I politely replied, "yes." The experience from the driver's seat was quite different. The SR27 is a piece of precision machinery. There were no squeaks, rattles or detectable weaknesses. True, the stage IV clutch rendered first gear a pipe dream, but the Deman pulled as strongly in 4th as it did in 2nd. Even more impressive was the handling. Obviously, by their very nature, all Se7ens are the stuff of track day dreams. But the SR27 was even more exacting. Credit the wider front track (also an option on many Caterhams) and stiffened everything else. While the passenger seat may very well have been the most frightening place I've ever sat, from behind the wheel, I've never felt more in control. Paul echoed my sentiments. See, when I got in the SR27 it only had 351 kilometers on the odometer. "I've never ridden in the passenger seat," Paul explained as I played psychotic bootlegger towards the North Carolina border. "How is it?" I asked him while mashing the rocket booster go pedal. "Scary!" he shouted. Massive Jalopnik bonus points for featuring the world's loudest blow off valve. Every throttle lift and upshift resulted in an infinitely pleasing, "Whoooosh!" It also happens to look great. In a word, fantastic. And the SR27 can be yours for $55,000. At 6'6", Doug Beckett is an unlikely Se7en proponent. Until he starts talking and you hear his Northern English brogue. He'll quickly tell you that when he lived in Old Blighty he worked on Jags, TVRs and Rolls-Royces for a living. Then he'll climb into his fiberglass, 1130 lbs. bright orange baby and, well, it all makes sense. Doug is the President of Raleigh based Autopro Motorsports and his sole product (at the moment) is a 1992 Miata powered Westfield 7. In fact his car is essentially a cannibalized Miata. The engine, transmission, differential drive shaft (sorry Doug, "prop shaft"), axle shafts, front and rear suspension components, brakes, steering bits, wiring, exhaust and even the instruments are all Mazda. While this particular car uses the first generation 1.6-liter, the frame can accommodate later 1.8-liter mills. It's cheap, too, with the kit starting at "$18,000 or $19,000" (one of the first things you learn when dealing with Se7en owners, is that numerical precision really isn't a top priority. The second is that you can pick 'em out of a crowd by the exhaust pipe burns on the back of their ankles and the gravel in their left ears) plus the cost of the donor car. This complete turnkey example will set you back a quite reasonable $28,950. Parts can of course be found anywhere. It's quick to build, too. Doug claims the build took him about 90 hours total and the only parts that didn't snap together were the steering and drive shafts, which had to be cut down at a local welding shop. 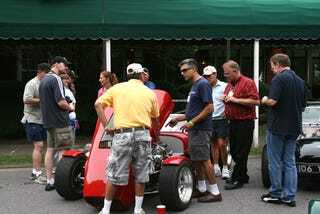 The car's quality was exceptional, and most in attendance agreed that Doug's Westfield had that certain something that set it apart. Other Se7ens were undeniably faster (see above) and perhaps even handled better. After a trip up and down the Dragon however, I knew this was the car I would take home. The APM Westy offered the perfect combination of raw sportiness and leisurely cruising that you can only find in a Se7en. Plus of course, like most of the others, it looks like the cat's pajamas. Doug plans on building and selling a dozen cars per year along with about 25 kits. I hope he sells a million. Meet the Rotus. What started out a stupid, racist joke has become one of the most mind-blowing vehicles I've ever had the privilege of driving. Most rumors hold that the name Rotus is due to the fact that these cars came with rotary engines. Not true. Custer Toyota in Fredrick, Maryland thought it would be a funny name for their Japanese-parts Se7ens that used AGE Toyota Twincam engines. Get it? The Japanese can't say their Rs. While it is true that one or two wankels got tossed in under the bonnet, what sets Mazda Ebrahimi's Rotus apart is that he managed to wedge in a 440 hp LS1 small block. Let's recap before we move on: An Iranian-American named Mazda owns a Japanese-American British-themed Se7en that features a Chevy 350. If that's not Fantasy Garage material, nothing is. If the Deman SR27 defies Newtonian physics, the Rotus messes with Einstein. It bends time and space. Weighing 1700 lbs and sending 380 horses to the wheel, Mazda freely admits that his Rotus has a hard time laying all that power down. "Other Se7ens might have me from 0-60 mph," he explained. "But I have them from 60-150 mph." And everything else on planet earth, too. All star Commenter Danio3834 is always quick to point out the difference between Japanese and American horsepower. As much as I hate to agree with him, he's right. And here's the difference. In the SR27, being belted into the passenger seat is horrifying. Yet, once you get behind the wheel, all that minimally-lagged power is quite manageable. Thrilling, sure, but you can work with it. The Rotus is always horrifying. The brand new 434 hp LS3 powered Corvette does the 0-60 romp in 4.4 seconds and weighs 1,500 lbs more! This monster has to be hitting sub-3. But again, exact numbers don't matter as the Rotus hits 80 mph faster than you can start urinating. Did I mention the brakes? Again, Corvettes stop exceptionally well for 3,200 lbs. vehicles. Mazda fitted Corvette brakes to the Rotus. I can barely describe the stopping power. Long story short, it hurts. And the very best part? It runs an unregistered copy of Windows XP. Still handles like a Se7en, too. There you have it. The 2007 Jalopnik Se7en Se7en Se7en Awards. I know I missed a lot of great cars and a lot of great people. Which is why USA7s need to invite us back next year.